Then consider looking to a small statue for help. St Joseph has been helping home owners sell their homes for years. But how did this tradition come to be? St. Joseph, the husband of Mary and earthly Father of Jesus Christ, is honored as the patron saint of married couples, families, carpenters and workingmen. 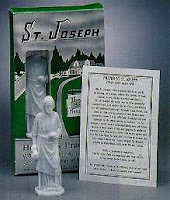 It is believed that a 16th century Saint buried medals of St Joseph in land she wished to buy for her convent and a tradition was born. …and the list goes on and on. Yes, it might seem silly. But what do you have to lose? If your home has been on the market along time here in Minneapolis, anything can help. Just don’t forget to say the included prayer….and no, you don’t have to be Catholic for it to work. All you need is a little faith! By the way, we had a home for sale in Florida that had been on the market for a year. I buried the statue in the back yard, upside down, following all instructions. Six months later, the home finally sold. Divine intervention? Who knows, but all I care about is that the home sold and kept us from going into foreclosure.